I don’t take sick leave from work lightly. My conscience tells me that I shouldn’t let my team mates down. The weighing up of the severity of my ailment against the potential for poor performance and the risk of infecting others determines the likelihood of my being away from work due to illness. Even so, I feel guilty when I’m at home. Being ill provides space for me to think as I don’t instantly fall into the ‘being at home’ routine. Thinking leads to creativity; yesterday I moved a knitting project forward after weeks of slumbering on the shelf next to my chair. Wanting to write is a sign of inner equilibrium and a step to recovery. During my short stint of incapacity the Autumn temperatures have been a warm 22 – 28oC during the day. Mornings have been in the teens, ideal for reconnecting with my love affair with cravats. 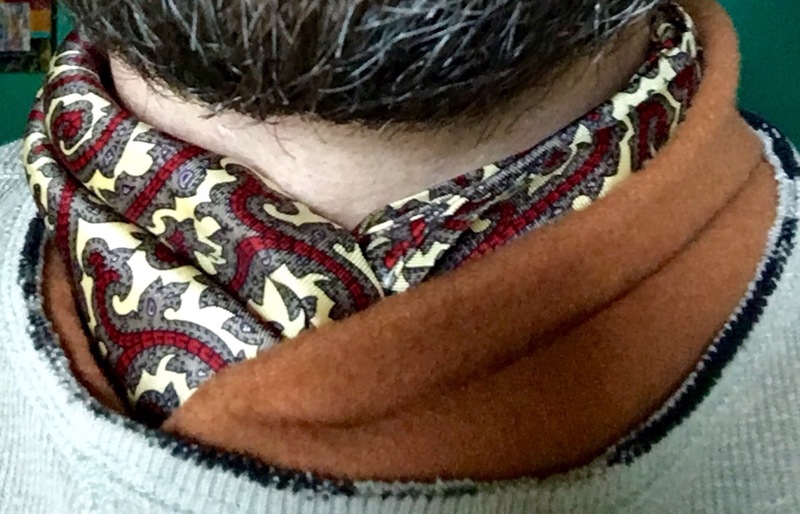 When the weather turns cool I eagerly make use of a silk cravat and lambs-wool scarves I bought in Italy around thirty years ago. I wonder if the cravat reminds me of creative types portrayed in the media of my youth and my wish to be like them. Alas, tomorrow I fear I will be free from mind numbing medication and the malady that sent me to my bed. I shall return to the reality of of the everyday with a renewed aim to record my thoughts so that I can be more productive in my blogging. It is crazy to feel guilty when doing the right thing – for everyone! Stay well. Hope you’re completely healed … soon! Wishing you both a creative fallow time and a quick recovery. I think it a sign of good breeding and responsibility when a person feels ‘guilt’ for being sick, and taking time off for it. I’m grinning ear to ear, thank you.